Prisimatic Window. A strong solution of sulphate of soda, thickened with a clear solution of gum arabic. Apply warm with a brush or feather. May be washed off when not required. An Economical Dish. Here is a simple dish dearly loved by children and a wonderful help from an economical point of view to the Sunday roast. 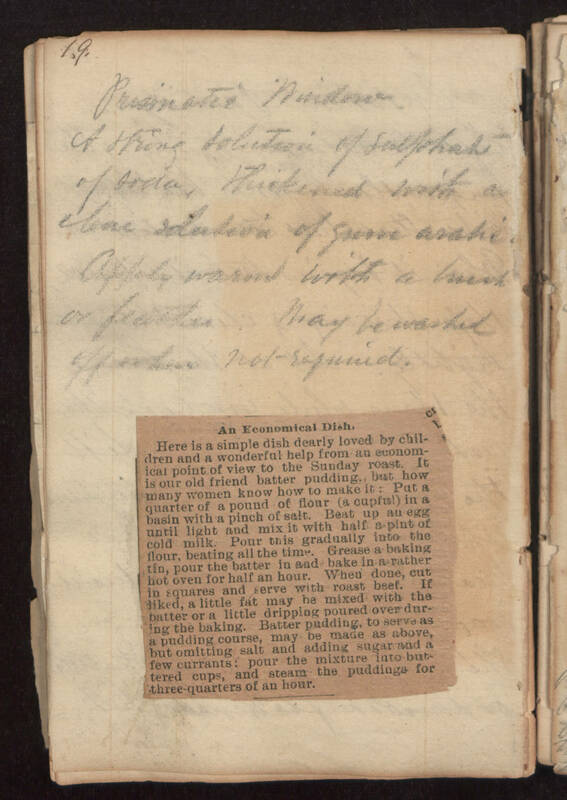 It is our old friend batter pudding, but how many women know how to make it: Put a quarter of a pound of flour (a cupful) in a basin with a pinch of salt. Beat up an egg until light and mix it with half a pint of cold milk. Pour this gradually into the flour, beating all the time. Grease a baking tin, pour the batter in and bake in a rather hot oven for half an hour. When done, cut in squares and serve with roast beef. If liked, a little fat may be mixed with the batter or a little dripping poured over during the baking. Batter pudding, to serve as a pudding course, may be made as above, but omitting salt and adding sugar and a few currants; pour the mixture in to buttered cups, and steam the puddings for three-quarters of an hour.